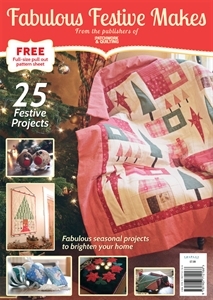 British Patchwork and Quilting Magazine: Fabulous Festive Makes! 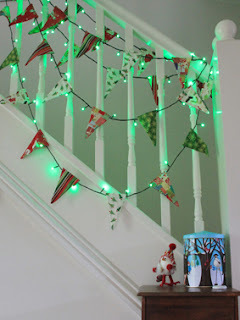 My favourite things for Christmas time are the decorations and I really enjoy the little secrets and beeing with the family. I really enjoy making Christmas banners with a different verse on each year. I like making table runners! It has to be making and decorating the little bags and boxes to wrap Christmas gifts in :] ...I can spend hours longer than it even took me to make or choose the gifts inside them!! it's just one of those great things about Christmas! 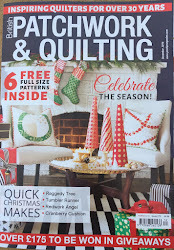 I enjoy making Quilted placemats for Christmas and they make a lovely gift too. Cookies. Hands down favorite. But... I also love to make gifts - small bags to hold goodies, table runners and scarves. ‘cos I make them every year. But never make for me! As I would be filled with guilt.